Alright, I’m still not caught up – but I do feel like I’ve accomplished something on this quilt top. This is Part 6 of the Mystery Quilt - the Ohio Star Blocks. You can also see that I’ve started the red strip pieced blocks, but I am nowhere near finished with those. In the small pink container on the side are the little triangle wings that go with the red strip triangles. Part 8: Put it all together! Well, I’ve done 5 out of the 8 parts – so that’s more than half… It’s such a beautiful quilt and pattern. 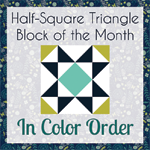 I can’t wait to have it all done, especially after seeing some of the other color choices and ideas other quilters had. You can check them out at the linkup on Quiltville. I’m hoping that there will be an opportunity to post a “finished” picture, but I may not have the top completed in time for that. Still, I think it will be neat to see what other people have accomplished. Your quilt is going to be sharp and stunning. Well done.